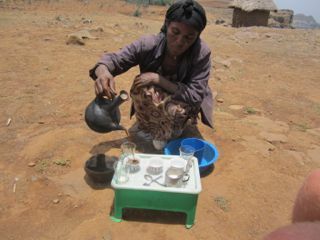 Ethiopian coffee - the best of the best. Period. There. I said it. 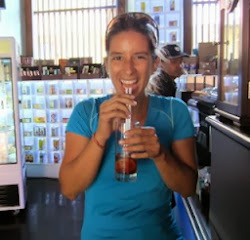 Yes, I'm Colombian and our coffee is fantastic and clearly (probably biasedly!) the best in the world. Or so I thought. After experiencing Ethiopia, I have to say that Ethiopian coffee is by far the best coffee I have ever had anywhere, ever. I'm just being honest here: nothing else that I have ever had comes close, and I think the secret to this wonderful taste and experience in the roasting. 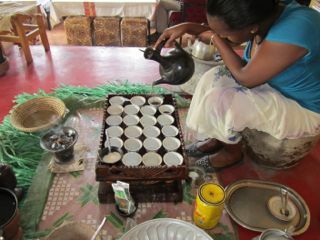 Sipping on home-roasted Ethiopian bunna (coffee) is much more than just a pleasant experience, it's beyond mind blowing! Just like injera, Ethiopians take their bunna very seriously. Coffee is typically drunk between three and four times a day and almost every single time before consumption, a coffee ceremony precedes. The raw, whole beans (which are likely not export quality) are roasted on a small pan over a fire. Darker roasts are roasted longer and lighter roasts don't get as much of the heat. The medium to darker roasts were the most common. After the roasting the beans, the roaster brings the pan to the drinkers so they can smell the freshly roasted beans. 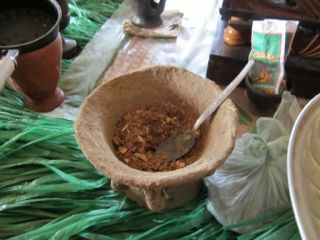 Then, the beans are ground by hand using a special mortar and pestel. The grounds are then added to hot water and frankincense is lit to create a nice atmosphere. After a few minutes, small coffee cups (simi) are rinsed and then the coffee is served. Usually, Ethiopians add quite a bit of sugar to their coffee but I always asked for mine black and proceeded to have at least three (and often more) servings. 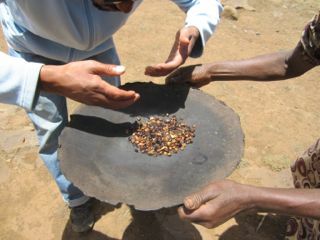 One of the nice things about coffee in Ethiopia is the serving size. Unlike crazy vent or 24 ounce sizes, bunna cups are very small and probably only hold about three ounces of coffee. Some of the macchiato cups can be a little bigger but probably wouldn't hold more than five ounces. Having more than one "cup" is therefore almost the norm. Legend has it that an Ethiopian farmer Kaldi discovered coffee. Many, many years ago, whenever the farmer's goats ate small red 'fruits' from a particular bush, they would be energized. The farmer noticed this only happened with the red 'fruit' so he decided to try it for himself and got the same reaction. Coffee was thus born but it wasn't until the Arabs began to trade it that coffee got really popular. Back in the day, Ethiopia was a much bigger country, known as Abyssinia and its territory included today's Eritrea, Djibouti, and parts of Somalia, Egypt, Sudan, Yemen and even Saudi Arabia. Coffee beans eventually made their way across the Red Sea to Yemen, hence the term arabica when it comes to some coffee beans. Today, Kaldi's is the Starbucks of Ethiopia, with stores all over the capital, Addis Ababa. One of the most memorable things about Ethiopia is seeing every little cafe always full of people, no matter what time of day. 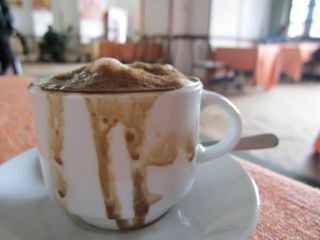 The cafe culture is very strong in Ethiopia, especially in the big cities like Gondar and Addis Ababa. The other memorable experience was the fact that almost no matter where you go, whether you're on a bus or walking around, the scent of freshly roasted coffee beans follows you around. The unfortunate consequence is that I now feel very spoiled and will probably stick to tea to avoid disappointment... until Sumatra in late July! I'd be happy to! Do you have any specific questions? If you are a true coffee lover, then you must try to buy coffee beans instead of ordering those grinded coffee packets that are easily available in the market, because it will help you to get that natural flaovour and taste that refreshes the mind and tastes too good. Thank you for your comment Buy Coffee. I could not agree more - roasting your own green coffee beans and grinding them at home yields a sublime coffee drinking experience! If anyone happens to live in the Bay Area, Sweet Maria's in Oakland is an excellent place to buy green beans and roasting equipment. I live in LA where can I buy the best roasted coffee beans ? If anyone wants to drink medium cups of the new dark roast coffee at a discounted price then I personally suggest to visit the different types of coffee shop. Hey, I appreciate your writing. Ethiopian Limu Inara coffee is by far the best coffee I've ever tasted. I live in Ottawa, Canada, and we're lucky enough here to be able to drink this in Bridgehead coffee shops, or buy them whole grain in bags and grind them ourselves at home. Thanks for sharing. On this subject internet page, you'll see my best information, be sure to look over this level of detail. We make sure that all lotto result that we post are accurate. However, we still encourage our visitors to visit the official PCSO website and verify the game results from there. Through questions and answers we will try to introduce the basics of the contemporary LED lighting. Explaining butik skyltar the facts about LED will help you to decide if LED lighting is ready to be introduced in your home or office. Through questions and answers we will try to introduce the basics of the contemporary LED lighting. Explaining Wishes have no religion like hollywoodneuz.net wishes for Christians are same as that for Muslims and Hindus or Buddhists and all other religion. One of the reasons for popularity of Singapore among the visitors is the number of festivals happening through out the year. These festival sometimes offers visitors Yacht and boats for rent in Singapore an opportunity for special offers from various hotels in Singapore. One may get discount in varying forms in these offers. Two popular festivals among these festivals are Singapore Fashion festival and Singapore art festival. One of the reasons for popularity of Singapore among the visitors is the number of festivals happening through out the year. you can download all your favorite drama download sites apne tv in different languages. An all-weather enclosure can prevent your LED television from experiencing any issues related to moisture or cold. This can help protect your investment and led skylt utomhus give your LED much more versatility for a very reasonable price. All-weather enclosures can be fine-tuned to fit the exact dimensions of your LED. You will always benefit from having a faster Internet connection, but your download speed is movies123 also limited by the upload speed of the server/source you are downloading a movie from.